I must admit that I was full of trepidation when I heard that a fully computer animated movie about "The Clone Wars" was about to be released and even worse, it targeted children. Thankfully I was pleasantly surprised and must admit that this is easily one of the "better" Star Wars movies around. Even the second viewing on Blu-ray as opposed to the movies was just as enjoyable, however the quality was even better thanks to our Panasonic high definition LCD TV which made the animation truly amazing. For those unaware of The Clone Wars, it takes place between Star Wars Episode II: Attack of the Clones and Star Wars Episode III: Revenge of the Sith and focuses on the power of the Republican clone army. Best of all, the familiar Star Wars characters that we all love and hate make a welcome return which include the soon to be Darth Vader Anakin Skywalker, Obi-Wan Kenobi, Count Dooku, Yoda and even some new faces such as Padawan Ahsoka Tano and the return of the creepy Asajj Ventress. The plot which is quite "child" orientated revolves Anakin Skywalker and Obi-Wan Kenobi in rescuing Jabba the Hutt's baby and returning him to the Hutt family before Count Dooku can frame the Jedi for "its" death. To compound the situation for Anakin, he has a new Padawan called Ahsoka Tano who is quite independent in her own right and the most annoying aspect of the movie was the way she called R2D2 as "R-tooie". Although the plot may be a tad clichéd at times, where the movie does shine is through its spectacular computer animated choreographed action sequences from lightsabre battles to huge galactic space battles that really immerses you into the world of Star Wars. The battles between between Anakin and Count Dooku plus Obi-Wan and the vixen-like Asajj Ventress is easily worth the price of this Blu-ray alone. Match that with the classic Star Wars humour, especially from the new comer Ahsoka Tano and this has everything that a good Star Wars movie should have. 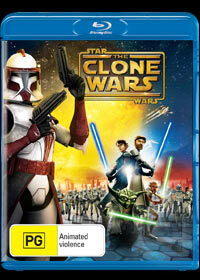 The video quality of Star Wars The Clone Wars is superb and looks amazing on Blu-ray thanks to the 1080p resolution which makes the animation look quite realistic at times. The colours are extremely vibrant and it has a real Hollywood blockbuster feel to it. The animation does take a little time getting use to which looks strange initially but at the end, I really fell in love with this animation style which almost looks like they have airbrushed the characters. Definitely very impressive. The audio also matches the phenomenal video audio and sounds brilliant through a surround sound setup. In conclusion, the only downside to The Clone Wars is that it feels like a pilot episode for a new TV series that in actual fact it is and the ending seems a little rushed as does the movie itself. Needless to say, it was still a wild ride from start to finish which really pays homage to the Star Wars mythology and creates something well deserved of the Star Wars name.